There’s no such thing as a bad time for a couple’s getaway in Alabama. The state is certainly not lacking for things to do or amazing places to stay, no matter what time of year you’re traveling. Whether you’re celebrating Valentine’s Day, a birthday, an anniversary, or simply each other, you’ll have the time of your life at these 10 best resorts for couples in Alabama. Luxurious from the outside in, you’ll feel like VIPs from the moment you arrive. This beach and golf resort offers plenty for you and your significant other to do onsite, including tennis courts, a swimming pool, and fitness center. Their grand 20,000-square-foot spa is the perfect place for couples’ treatments that will help you unwind together. Though having been rated one of the top family resorts in Gulf Shores, this resort shouldn’t be ignored as a couple’s retreat. Direct beach access and ocean views are reasons enough, but couples also love the on-site spa, waterfront restaurant, bike rentals, fitness center, and other amenities mean you may never have to leave the resort. This upscale, elegant hotel is no stranger to the limelight. Having hosted hit musical talents like Aretha Franklin, Bob Dylan, and Otis Redding, guests love feeling in the presence of such prestige. Couples can relax at the on-site spa, enjoy lush accommodations, and enjoy the scenery of one of the most beautiful hotels in the state. This Gulf-front resort has everything you need for a weekend or week long getaway. Though a favorite among families, there’s no shortage of activities for adults, including jet ski and boat rentals, pool, golf course, dolphin cruises, and an upscale restaurant that’s perfect for date night. This waterfront beach resort has a lot going for it: clubhouses, tennis courts, and bike paths are all tucked inside this exclusive neighborhood. Couples can book a stay in a luxury condo and enjoy spacious, upscale accommodations that truly feel like a vacation. Not all resorts involve surf and sandy beaches. Pursell Farms is a delightful golf resort in a farm like setting. Everything from the rooms to the food to the scenery is nothing short of breathtaking. Couples can take advantage of the luxurious spa and exceptional meals while enjoying the romantic atmosphere. This picturesque hotel is within walking distance of some of Birmingham’s best attractions. Couples can enjoy a short walk to the zoo or botanical gardens, then come home to gorgeous suites, each one featuring a custom look and feel. Their spa offers the perfect services for couples to share some R&R, and you might never want to stay anywhere else. This lover’s paradise will give you much to look forward to. Private balconies, hot tubs, restaurants, and club level rooms make this resort the perfect Valentine’s Day getaway (or any other time you need a romantic setting). With monthly wine dinners and couples’ packages, you won’t find a better place on the Gulf Coast for an amorous vacation. This destination from Spectrum Resorts will leave couples wanting for nothing. 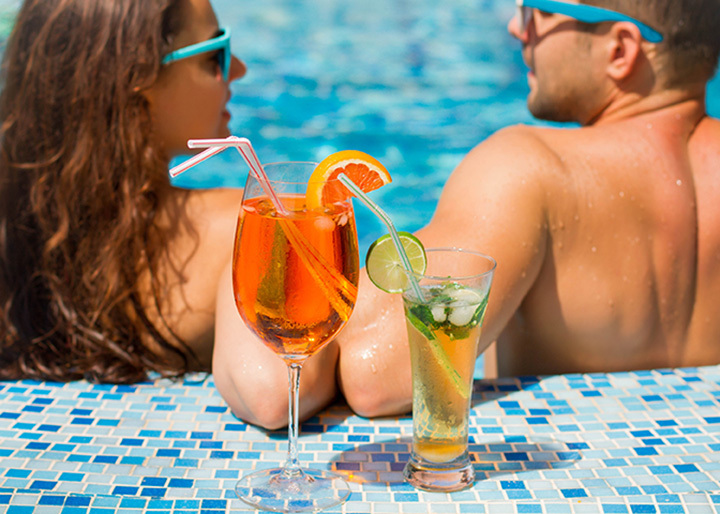 Aside from beachfront access and multi-bedroom suites, couples can enjoy Spectrum’s world-class amenities, such as requesting grocery delivery to their room or indulging in the five saltwater that makes even swimming feel like a day at the spa. The rooms here are palatial, and you’ll want to move right in. You and your partner will feel like royalty when you arrive at this castle-esque resort. Sophisticated and attractive, the amenities here will keep you busy: saltwater pools, poolside bar service, waterfalls, a slide, and home to an Aveda spa, your vacation is likely to end well before you’re ready.